The Finns converted 18 captured BT-7 tanks into self-propelled howitzers in1942-43. Dubbed BT-42, these vehicles housed a 114 mm British WWI howitzer in a domestically designed, rotating, box-like turret. They proved to be relatively weak performers, and were vulnerable to Russian tanks and AT weapons. All but one are now destroyed or scrapped. Unimodel has just released a complete kit of the BT-42 in November 2004, which I have not yet seen. 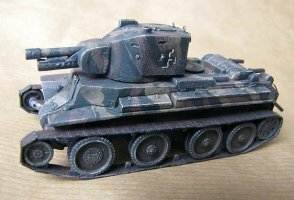 My model was built some months earlier on the basis of the Unimodel BT-7 kit, and so the turret and gun had to be scratch-built. As one is accustomed to expect from Unimodel, the kit looks very good and detailed in the box. The two-layered construction of the lower hull with the suspension springs partly showing is especially beautiful as are the finely detailed hard plastic tracks. The engine grille in PE is a nice touch, but it is small wonder why the ventilation openings on the central and aft deck sides were not provided with PE mesh, too  now they are completely flat and unrealistic. The turret and gun of the kit were not relevant parts for my project. Otherwise they look to be quite OK, but the closed hatches are sure to be a disappointment for many modellers. The build of the hull was very straightforward and gave no serious trouble. However, the hull deck wouldnt fit flush with the hull sides and had to be smoothed with putty. There were also some fit problems with the front ends of the fenders where they meet the hull. These problems were a bit annoying, but not too difficult to work with. One more surprise occurred when it became obvious that the tracks had to be cut shorter somewhere along their length, otherwise they simply would not have fitted. The long links made this task tricky, but hiding the cut under the wheels helped masking the error. Finns did not have the curving front fenders installed, so I cut them off. The major challenge of the build stemmed from the need to construct the turret and gun from scratch. 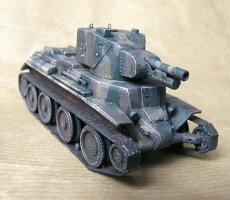 Luckily the turret of the BT-42 has a simple form with rather limited details, and so I was confident to start the conversion. I did not have proper blueprints for the vehicle, but instead translated the measures from photographs. I began the work with the mid section of the turret, which I simply made of plastic sheet, rolling and gluing it to form a slightly tapering cone (it could also be based on the conical version of the BT-7 turret). After the cone was cut and sanded to a correct height, the boxy rear part and the top for the turret were constructed of styrene sheet bits, with some supporting structures planted inside the turret. Turret hatches, a "bump" for the gun sight, lift rings and hinges for rear exit doors made of various materials (plastic, wire, foil) were then added. 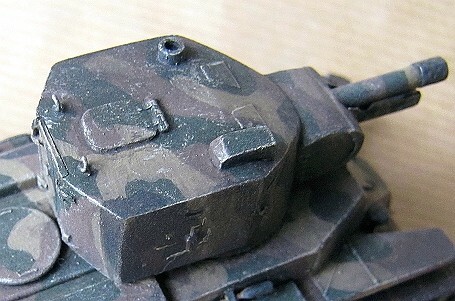 Finally, small vision slits were cut to the turret sides and filled with PVA glue, which makes clear screens once dry. The shape and size of the turret are otherwise close calls, but the central cone should be tapering more steeply. This is where my scratch-building went off worst. The gun mantlet was made by means of laminating styrene sheet into a block, which was then sanded to shape. The mantlet was then covered with foil that had small dents pressed to it with a pointy needle file to imitate bolt heads. The gun barrel is a piece of hollow styrene rod: it has a foil strip (with tiny holes pricked with a needle) rolled around the barrel end, thus working as a muzzle brake. The gun support beam is also styrene, which is cut and filed to shape and detailed with braces cut out of copper sheet. In addition, three self-made tool boxes (made of styrene beam, foil and wire) and some equipment, like a showel and a shortened gun cleaning rod from the spares box were added. Some braces and covers made of copper sheet were also added on the rear plate and the exhaust pipes were drilled open. I also covered the above mentioned side ventilation openings with a fine mesh (my favourite, metal mesh coffee filter used as a supply here). 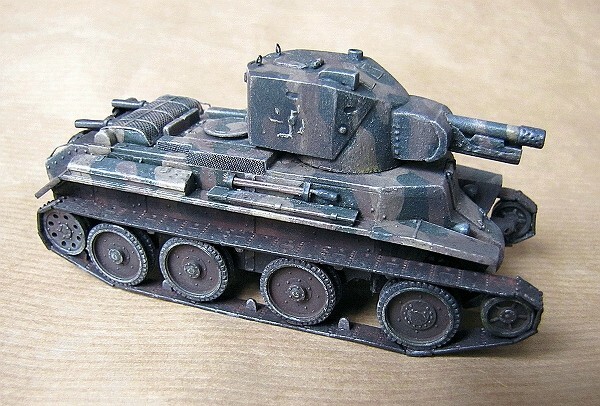 Considering the simplistic shape of the extra parts needed to turn the BT-7 into the Finnish BT-42 assault howitzer, the build was not too complicated. There were some parts, however, that I wished I had more sophisticated methods to produce. The model is represented in a brush-painted, late war hardedge camouflage with Tamiya XF-52, XF-57 and XF-58 colours. The "hakaristi" insignia were self printed and outlined with white paint by brush. The markings were hand-painted in real life, and so the clumsy outcome is partially justified, but to be honest, I would have liked the outlines to end up being neater. Well, with these sausages for fingers this is the best I could come up with. A highlighting in white, a black wash and a diluted grey overspray followed with a satin coating, and the model was almost finished. The final touch was given with rusty pastel chalk treatment on the tracks, similar treatment on the running gear with earth shades and a black one around the exhausts, and so was this eccentric vehicle ready. You know how it goes nowadays: once you finish a scratch-building project, the kit will immediately be released by an established model manufacturer. In this sense I was a bit too hasty with this build of mine, this time. 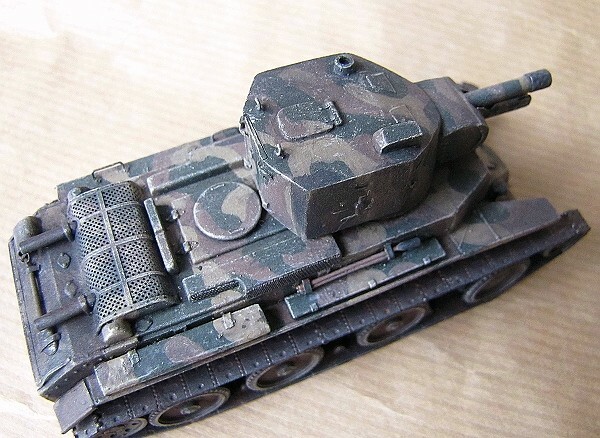 Had the BT-7 kit been of poorer quality, I would not have started with the conversion at all. Now that it is done, Im glad I took the challenge, as it was an important step to build my confidence as a scratch-builder. The outcome leaves a lot to be desired, but it was a fun project, which, of course, is the main reason to build models in the first place.